The following is a brief introduction to how Japanese convey politeness through special verbal construction. This will not be covering special nouns, just the verbs; because we’d be here all day if we talked about nouns. Politeness in Japanese is conveyed on two axes: one of politeness (or gentility, if it makes the double use of the word less confusing) and one of status. Gentility refers to one’s disposition, to one’s character, to the energy one wishes to convey. This is very simply handled in Japanese. Here’s something interesting: the language one uses for a person is determined by the person one is talking to. If you are talking to your boss, you refer to your boss with honorific language, and to yourself with humble language. But if you are talking to a customer, you refer to them with honorific language, to yourself with humble language, and to your boss in humble language – because you are representing the company or business and the company as a whole is subservient to its customers. To make a verb polite, you take the verbal stem, add the appropriate mood suffix, and add an -ιmas suffix to it; and then a subsequent temporal/polar suffix to it. /ι/ stands for a weak vowel that appears in the surface form of a word as an /i/ whenever the lexical stem of the verb does not end in /ε/, which is a vowel that occasionally appears in the surface form as /e/ and sometimes not at all. I talk all about it in my verb runthrough. You can add the polite form of the copula da, desu, to the end to take more polite, albeit semi-illogical. In this case, the verb desu is not acting as a verb but as a politeness suffix. Here’s the catch: Japanese admits this kind of politeness as standard only when it is the verb of a verb phrase that is not embedded into another verb phrase. This means that indirect quotes are not conjugated for politeness, and neither are attributive phrases. Humble Verbs and Honorific Verb are a bit more tricky, because there exist a few verbs that imply humility and are used in humble language. 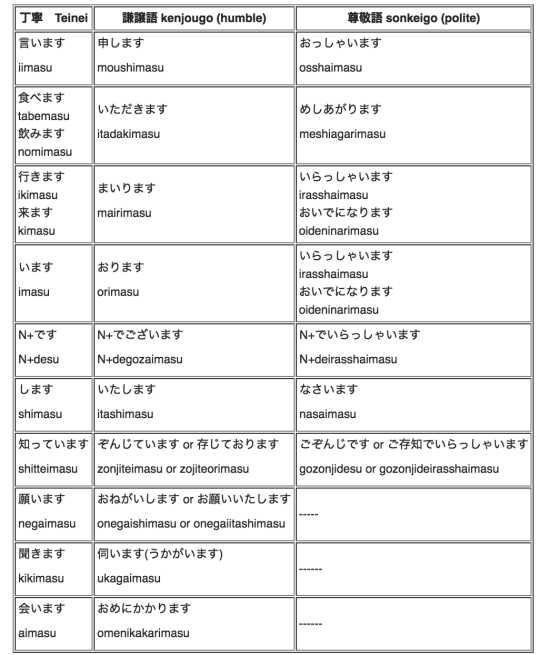 Let’s look at a quick table where there they use Teineigo and Kenjougo and Sonkeigo together. Other than these exceptions, which are admittedly very common verbs, the verb construction is to take the verb’s verbal stem, add the prefix o- and the verb “suru” in Kenjougo and “naru” in Sonkeigo. If there exist a special verb with the humility or honor implied (so if it’s part of the list), then one does not use this construction. Kenjougo and Sonkeigo work along with Teineigo as seen in the table, but this is only when applicable, not all the time. It tends to be that if you are going to work along the status axis, you are going to be making your verbs polite. The only place where this is not the case is in anime and perhaps some dramas, where you hear the governing verbs of IPs in their plain form. Address suffixes are also considered part of Keigo. To speak on those briefly, for this is probably the most common form of Keigo. The standard address suffix for people is -san. The address for people of authority who have some form of didactic/guiding role is -sensei. The address for someone who is of a higher rank than you but not -sensei, used mainly in schools by lowerclassmen to upperclassmen is -senpai. The -sama address is used for someone of an unbelievably high rank, like high religious figures and royalty. The address suffix -kun is used towards young males. The address suffix -chan is an address suffix used for children and animals; and it is also an intimate address suffix for young girls. Note that -kun and -chan are not equivalent. A young girl can call a young boy -kun without knowing him well, but the boy cannot call the girl -chan. The intimate address suffix -bou exists for males, but does not carry into adolescence, and thus is used for small boys.